It’s been a busy couple of weeks around here. 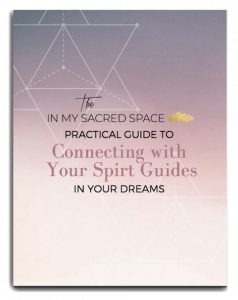 Last week, I launched a new ebook, “Practical Guide to Connecting With Your Spirit Guides In Your Dreams.” I spent the majority of last week visiting my mom on the gulf coast and I was able to knock out yet another ebook, my Karmic Dreaming Guide on tapping into your past lives using your dreams. And, on top of everything else, my online dream interpretation course launched today! Thank you to everyone who has supported me thus far. This little blog is evolving into something so much more than what it began as, and I couldn’t have done it without you. I hope you’ll all continue to lend me your support as it grows and help me create something truly amazing! Arusting yourself and the information you’re receiving is one of the hardest things to do when you’re developing your intuitive abilities. That being said, I think your skepticism is a really great sign. Discernment is very important when it comes to these things, and I’d be a lot more worried if you weren’t questioning anything at all! I think the best advice I can give you here is something that I talked about in my previous blog series on how to contact your spirit guides. It’s easy for us to get so wrapped up in judging ourselves and whether or not we’re right or wrong and that puts a lot of unnecessary pressure on you to make a snap decision about the information you’re receiving. Instead of feeling as though you need to judge yourself one way or the other, just hold it as a possibility. When you just hold it as a possibility, you’re able to say, “Alright. Let’s just see where this goes.” and there’s no cognitive dissonance associated if it doesn’t pan out, and you don’t run the risk of being gullible. Just roll with it! Eventually, you will start to collect enough evidence to support when you were correct and it will build your confidence. Not worrying about whether you’re right or wrong allows you to focus on the process itself, observe what it feels like and you’ll begin to learn what feels like intuition and what doesn’t. Removing your ego from the process is the hardest part, but having a healthy dose of skepticism is a great foundation for discernment.